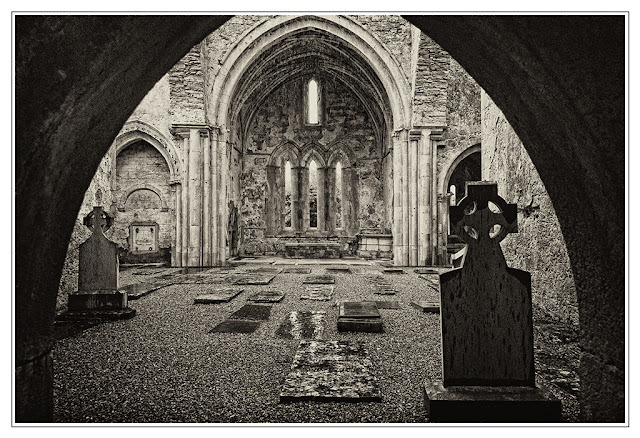 A few more sites I wanted to visit in the Burren were...Corcomroe Abbey..a public site, the Carran Church and Leamanagh Castle, the later two on private lands yet visible from the road. It was raining hard when I made it to Corcomroe Abbey but I grabbed my gear anyway and headed over the steps to the Abbey grounds. By this time my driving skills had improved! One lane roads with no markings and lots of blind corners had become my friends! As the day worn on the rain ended and the blue sky became filled with large white summer clouds. 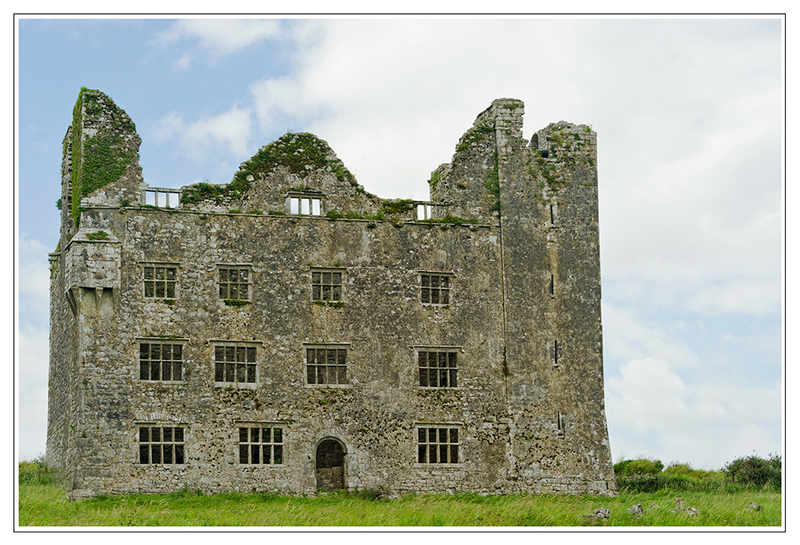 Leamanagh Castle is a distinctive structure in the south of The Burren region in Co. Clare. It is composed of the original tower house built in 1490 and an extensive dwelling house that was added sometime in the 17th century. 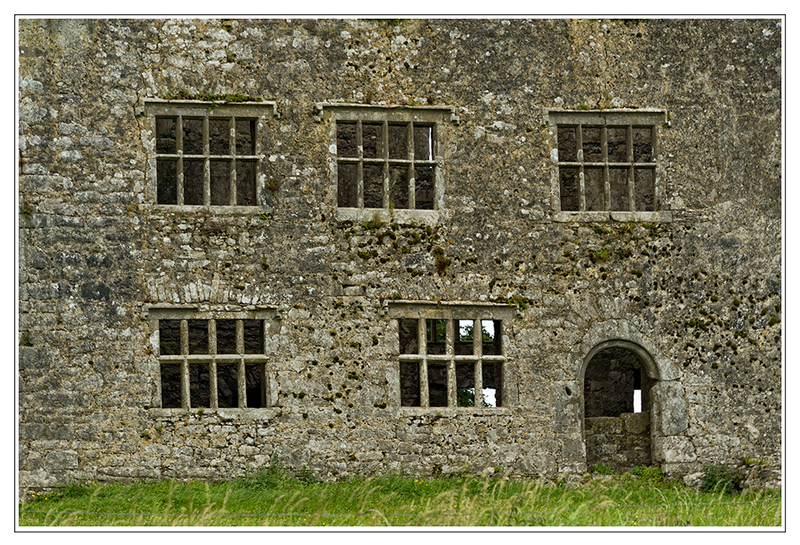 It used to be the home of a very fiery lady by the name of Maire Rua. 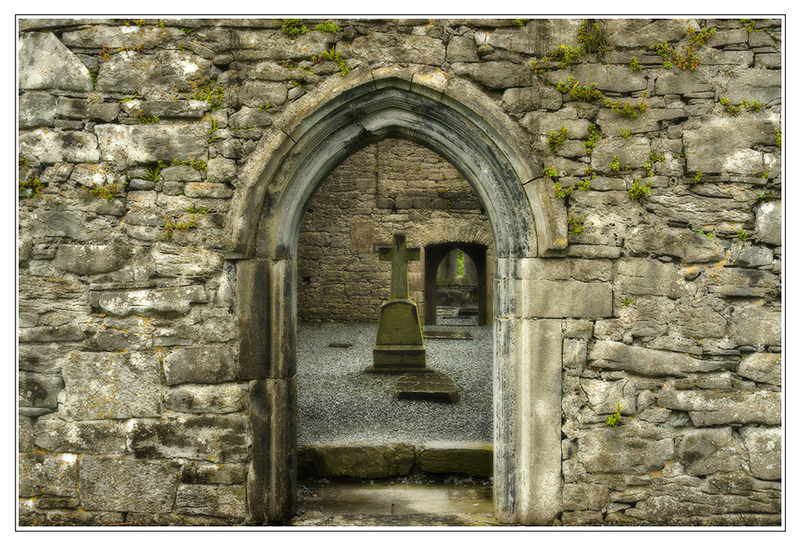 It is situated at the intersection of the R476 Corofin-Kilnaboy road and the R480 road to Ballyvaughan, at the southern boundary of the Burren. 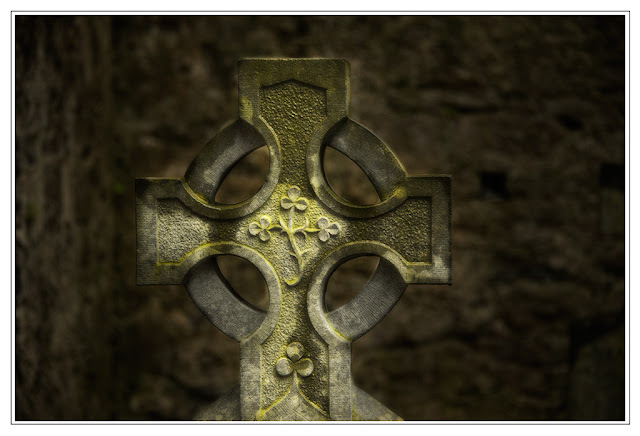 Marie was the daughter of a chieftain of the O'Malley sept. Marie was thrice married and an stute protector of her lands in Leamaneh, which she had inherited from her second husband, Conchubhar O'Briain. Marie married (1) Donall O'Niallain, who had lands in Dysert O'Dea - he died five years later, leaving her with four children; she married (2) Conchubhar O'Briain, eight months later and had five more children. 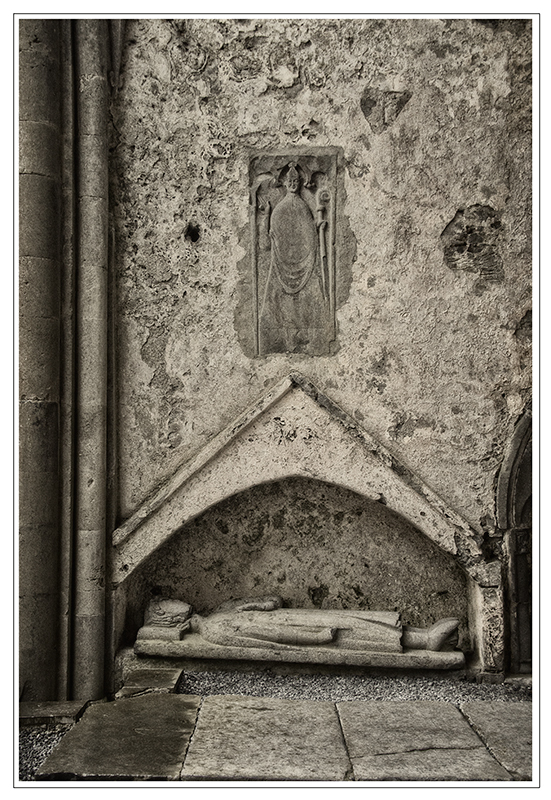 He was killed fighting the Cromwellians (1651) and she married (3) a Cromwellian officer John Cooper (1653). Of her three husbands, husband number two was the most famous. It was said that the pair of them would waylay and rob travelers who passed too near to their castle, and hung from the walls those who fell foul of them. Marie was placed on trial (1661-1663) for the murder 20 years earlier of a servant of an English settler - she was not convicted. Marie lived and ruled over her lands at Leamenah till her death, after which a series of legends grew up around her and she became famed for having many many husbands. This castle was amazing, I wish I could have gone in and just walked around the shell. The stone mullions in the windows must have been beautiful when filled with glass. I can only imagine! 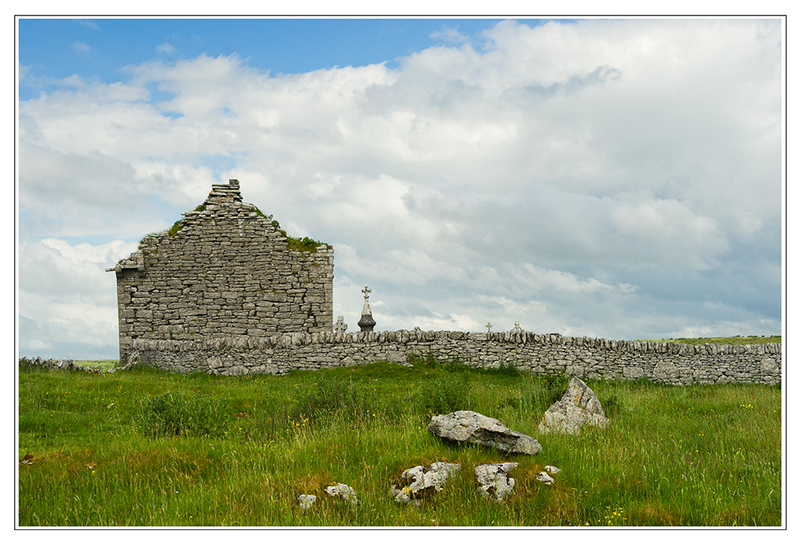 The Carran Church is also of Medieval times and sits on a high knoll behind a rock wall. 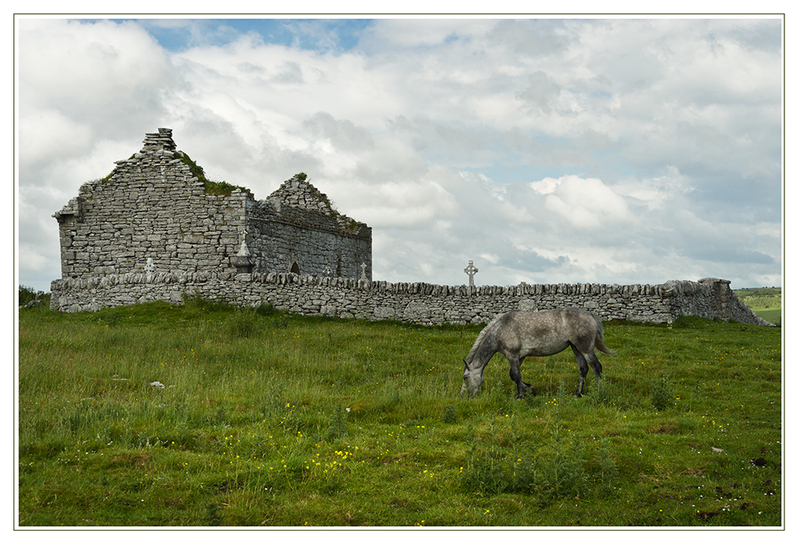 This was the first Connemara pony I saw on the trip and I just loved the beauty of the animal in this pasture with its stone grey color.